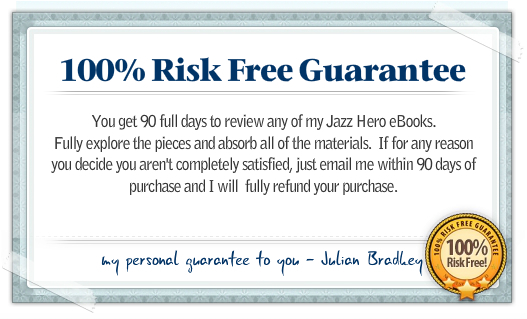 Jazz Theory Explained ($35): my written book on jazz theory. I cover all tonal aspects of jazz including jazz scales, improvisation, embellishment, chord voicings, reharmonization, basslines, world jazz styles like bossa nova, and cuban salsa – and much more. Collector’s Edition ebook ($29): 8 of my most popular Jazz piano pieces – includes ‘Falling in Love for the First Time’, ‘Dancing With You’, and ‘Venice Beach in Winter’. Comes with backing tracks and original recordings. Blue Lotus ebook ($15): a relaxed Latin Blues in A minor – comes with 2 transcribed solos. 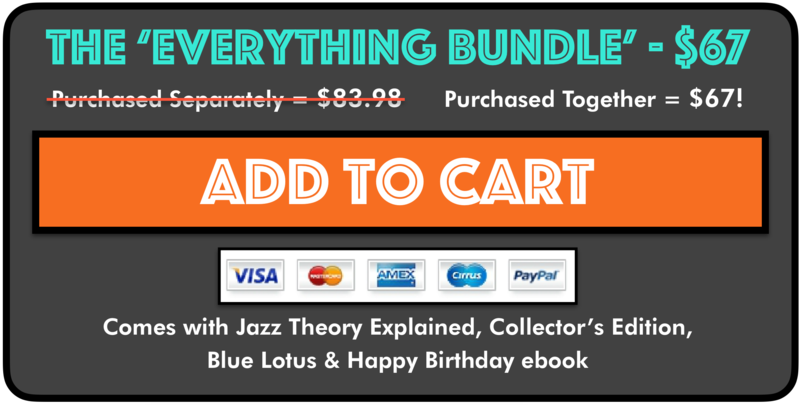 Happy Birthday ebook ($15): an elaborate Jazz piano variation of Happy Birthday. Merry Little Christmas ebook ($15): a festive Jazz Piano Christmas arrangement. Your purchase directly support the making of my free Jazz lessons on YouTube. For piano players only | 5+ years playing experience | Reading music is necessary. 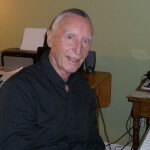 Ray Huckell, (Toronto): “When I decided to learn jazz piano 5 years ago, I searched high and low for a competent teacher who could lead me along the trail of developing a JAZZ SOUND. I lucked in to Julian Bradley on YouTube, watched every video he presented, made copious notes and went through the horrors of “oops, which video did he use to show his favorite major 7th voicing”. All of that is in the past as Julian has now published the most understandable explanation of the complexities of Jazz Piano and Theory. Terrific and easy to understand, what every visitor to your videos is praying for – a true GOLDMINE!”.